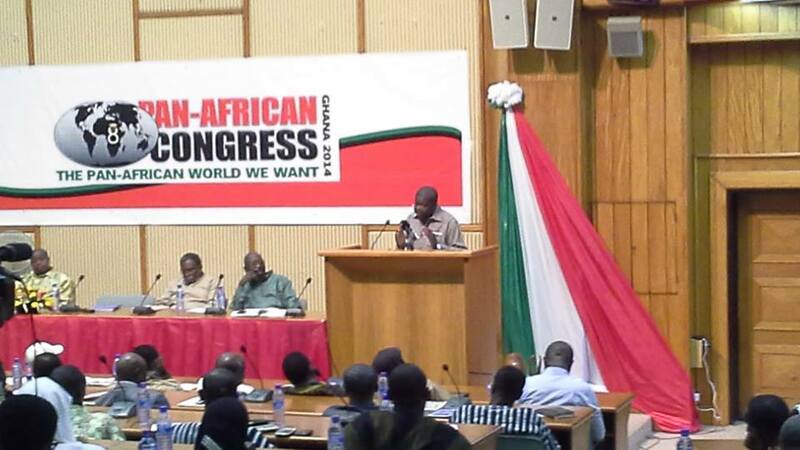 The Pan African Congress was held 21 years after the previous one. Its resolutions capture the Congress’s desire to re-ignite the Pan African spirit, enthuse commitment to our African identity and inject energy into the Pan-African Movement. We, the representatives of the global Pan African family, gathered in Accra, Ghana from 5th to the 7th of March 2015, to review progress made thus far since the Pan African Congress in 1994 and to take stock of the continual challenges confronting African persons of African descent globally. This represented the first session of the 8th Pan African Congress, with the second session to be convened by May 2016. The President of the Republic of Ghana, H.E John Dramani Mahama, officially opened the 8th Pan African Congress and delivered a keynote address calling upon all African governments and people to take practical steps collectively – and in solidarity- for the unification and development of Africa. We recognized that we belong to a historical tradition of congress and regional meetings that have convened over irregular periods since 1900, incorporating ardent Pan Africanists of various persuasions from the Global Pan African Family, who brought ideologies and political practice from a diverse set of circumstances in a search for a more positive future for all. We affirmed the contributions of the 1994 pre-Congress of women that established the Pan African Women’s Liberation Organization to address the specific needs and aspirations of women activists in the Pan African Movement. We acknowledged that the world has significantly changed since the 1600 delegates, men, women and youth from twenty countries and six continents, gathered in Kampala and it is in that context that we understand the challenges and contradictions faced by the standard bearers of Pan-Africanism. It is also in that context that the Resolutions of the 7th Pan-African Congress were adopted, partially implemented or completely ignored. Specifically, the head of the Secretariat, Tajudeen Abdul Raheem, was acknowledged for playing a significant role in laying the groundwork for the continental transition of the Organization of African Unity to the African Union in 2000. This capacity to grasp complex situations with multiple interest and players was also deployed by the head of the Secretariat in expediting dialogue between the African Union, Civil Society and the Regional Economic Communities. As a direct result of the persuasive powers of the PAC Secretariat head based on the resolution of the 1994 delegates, Ethiopia amended its policy to allow the majority of Africans to apply for a visa on arrival. Uganda and Tanzania subsequently followed suit. We unreservedly applaud Mauritius, Seychelles, Mozambique, Rwanda and Comoros that facilitate visa-free or visas on arrival for all African citizens. This is a significant step in the often expressed desire for a continental passport. Communication on these and other initiatives were shared on a regular basis via “Tajudeen Postcards,” a short form of expression that cogently captured existing challenges and successes while sharing a brief historical narrative that provided an appropriate context. These briefs have been captured in book form under the title “Speaking Truth to Power” effectively serving as a potential guidepost for the future. Structurally the Secretariat established a Youth Desk and Women’s Desk, both of which were functional for approximately six years after the 1994 Congress. Due to existing external conditions which undermined earlier optimism regarding fundraising, the Secretariat was unable to fund these two operations after that time. However, both sectors have continued to contribute through the work of volunteers, with the Youth able to do so more regularly. Youth Regional Meetings, workshops and mobilization drives have kept the mission of the Pan African Congress viable, especially within the East African Community States. We acknowledged that all these achievements were only possible through the generous support of the Uganda government who provided not only concrete resources but a sense of legitimacy both within and external to the host country. Focusing on current conditions, we recognized the obligation of the 8th Pan African Congress to address in the most forceful terms the recent examples of the violation of territorial sovereignty and personal dignity, and specifically the abductions (and subsequent murder of one) of Presidents Laurent Gbagbo and Muammar Gaddafi. We called for an African member of the Security Council to ensure an African Voice for both policy discussion and votes that are supportive of Global African Unity. We also recognized that the establishment of an African Union brigade could effectively serve as a stabilizing force in areas previously destabilized by Western interests, such as in Libya. We welcomed the decision by the governments of the Republic of Cuba and the United States of America to re-establish diplomatic relations between both countries and call on all African governments to continue to support the lifting of the US blockade against Cuba in all international forums. We acknowledged the need for strong collaboration, especially through citizen input, with existing Pan African entities and initiatives, such as Agenda 2063 of the AU, and especially those identified to promote the Sixth Region of the African Union and the United Nations Decade for the Peoples of African Descent. Efforts such as these can serve to educate and stimulate individuals within the Global African Family who have not been previously reached to be mobilized in their own interests. We viewed with alarm the root causes that drive so many African youth to migrate from the continent, only to end up in desperate straits of indentured servitude, especially young African women. We received solidarity messages of support from the highest levels of government from Algeria, Benin, Brazil, Equatorial Guinea, Iran, Togo, Venezuela and Zimbabwe in addition to the Instituto Cubano de Amistad con los Pueblos. We reiterated our opposition to the imposition of a neo-liberal Agenda that has and continues to impoverish Africans farmers, peasants, workers, women and youth. We unequivocally acknowledged the centrality of equal and equitable representation and voice in all development and governance processes. In particular we recommit ourselves to these principles of non-discrimination, equality and equal representation of women and youth in PAM structures and processes. We collectively called for the total liberation of all Africans and persons of African descent still living under the yoke of occupation, colonization and oppression, including as one of the last colonies in Africa, Western Sahara, Martinique, Mayotte Comoros, Chagos Island, Puerto Rico, Cayenne, Guadalupe, and West Papua. We strongly condemn all forms of religious extremism and other forms of fundamentalism and uphold building an environment for religious freedom of consciousness and expression. We condemned the recent murders of 21 Egyptian citizens in Libya. We unequivocally condemn the unchecked violence being perpetrated by extremist groups such as the Jama’atu Ahlis Sunna Lidda’Awati Wal-Jihad (Boko Haram), Al Shabaab, Islamic State of Iraq and Syria (ISIS), Al Qaida, Democratic Forces for the Liberation of Rwanda (FDLR), Allied Democratic Forces (ADF), Lord’s Resistance Army (LRA) and Janjaweed against African people while recognizing that neoliberal policies and imperialist interventions are the real cause. We re-committed ourselves to Global Solidarity Action in mutual Support of Struggle of the Global Pan-African family. 1. Ensure that African governments not pursue neo-liberal development pathways and instead seek to build local industrial base founded on value addition. 2. Promote the development of common African currency for the African continent, with concurrent supportive monetary policies, as a basis for the development of a real alternative to neo-liberalism. 3. Reiterate our opposition to the privatization of public assets to the detriment of the rights, livelihoods and legitimate interests of populations. 4. Call upon African governments not to ratify the Economic Partnership Agreements (EPAs) with the European Union (EU) as these would be ruinous to the masses of the African population, primary producers, workers and self-employed small-holder farmers. 5. Ensure that natural and national resources should be utilized in a manner that benefits present and future generations of Africans. This should include policies that reject use of GMO stock, support plant variety protection and address the development of a central seed bank with subsidiaries in various parts of the Pan African world. 6. Encourage local economic and social development anchored on collective ownership, control, management and benefit by communities. Current concerns include, but are not limited to, land reclamation after legal and illegal mining activities, restitution of barren farm lands, slash and burn methods that destabilize forest areas and community control of timber cutting. 7. Recognize the long-term threat posed by genetically modified organisms and reject the commercialization of seed stock that jeopardizes Africa’s own food sovereignty. 8. Recognize that sustainability is a hollow concept without a healthy population and therefore call on PAM at all levels to address traditional and Western forms of medical treatment and care and to share this knowledge appropriately. 9. Call upon the African Union (AU) to establish clear norms and a body of professionals to regulate medical research by multinational corporations and external institutions in Africa in order to stop the exploitation of the poor and uninformed. 1. Commit to addressing structural barriers that keep half of the pan-African constituency subjugated and unable to access freedom, justice and dignity. 2. Commit to the documentation and preservation of women who have made immense contributions to the Pan-African movement and commit to ensuring they form part and parcel of the collective memory and public imagery of dominant/mainstream narratives of pan Africanism. 3. Call to memory and demand the immediate release and rescue of the over 200 girls who were abducted in Chibok, Nigeria close to a year ago and still remain abductees, and to ensure provision of socio-psycho and material support upon their return. 4. Stand in solidarity with and call for the immediate freedom for women and girls and the peoples of Sahrawi Democratic Republic (Western Sahara) from colonization and patriarchy. 5. Call for universal and immediate ratification and implementation of existing gender responsive instruments (Maputo Protocol, Solemn Declaration on Gender Equality Agenda, CEDAW, Beijing+20, 1325, 1820) as well as ensuring accountability for non-compliance as a way to further ideals of pan-Africanism. 6. Commit to strengthen healthcare systems and volunteerism to prevent and effectively respond to crises such as Ebola. 7. Recognizing that we cannot afford to sustain practices that are harmful to the dignity, respect and freedom of women and girls, including FGM, child/early/forced marriage, widow inheritance, breast ironing, indentured servitude, especially in the Middle East, and thus contrary to ideals of pan-Africanism, we call for their immediate abolishment. 8. Push for equal access to, control over and ownership of Africa’s resources (between men and women) – ensure progressive land policies and secure access to land rights for African women. 9. Address all forms of violence against women and girls, the radicalization of violence and sexism in both private and public spheres, religious fundamentalism and extremism that threatens progress and freedom. 10. Address illicit financial flows, ensure tax justice – progressive taxation, remove VAT on essential products and direct these as well as other funds to finance the African women’s movement as a means to further the cause of pan-Africanism. 11. Effect a policy on IDPs and their treatment and their human right to dignity. 12. Ensure inter-generational mentoring, exchange and learning takes place; that young women will have a place in discussions, deliberations and decision-making spaces. 13. Reach out to and create linkages with existing structures, networks and platforms including the African Feminist Forum, for greater synergy and impact. 14. Must put to an immediate stop the plunder, not only of mineral resources, but most importantly of human resources, the women and their bodies (DRC). 15. Address the burden of unpaid care work that falls largely on women and girls and has resulted in the large number of women affected by Ebola. 16. Establish as a principle of 50% representation of women in decision-making within 8th Pan African Congress structure (Interim processes, International Planning Committee and Governing Council). 17. Ensure the convening of a women’s congress prior to the second phase of the 8th Pan African Congress, and the resuscitate the women’s desk and congress. 18. Define and celebrate the African woman. Her image as defined by the African women, her color, Her Strength, Her Creativity. Alleviate the burden on the African woman. Change the depiction of African women and celebrate the African woman in all her diversity. 19. Support the creation of a reparation fund that is tax free and 60% directed to the status of the African women. 20. Recognize the political rights of women and must be promoted and protected, in terms of attending meetings, voting rights etc. 1. African Nations should explore alternatives sources of financing the key regional bodies on Peace and security, good governance and democracy for higher effectiveness and coherence, including AU and Regional Economic Commissions. The commission recognizes that states are already undertaking additional measures away from donor funding and encourages them to continue in that search of alternatives. 2. There are a lot of external actors and foreign states embedded in our governance and economic systems which we regard as a dangerous situation. African States should be governed following their own interests and priorities and they should be able to make decisions that work for them in the long term and that do not weaken the already fragile economic structures. We specifically call for the removal of the USA facilitated African Command and all other foreign military bases in Africa. 4. The reduction of poverty is key to the promotion of sustainable peace and security and the need for implementing mechanisms that address and control corruption. 5. African States need to address poverty as the key cause of conflict and insecurity, as well as to address new challenges to peace and security such as radicalization, terrorism, etc. 6. African States need to reinforce their commitment to national and regional instruments that seek to strengthen the spirit of Pan Africanism, especially in a South-to-South context, highlighting the commitments towards the UN resolution 1325 on women, peace and security; and the AU Agenda 2020 to end all armed conflict in Africa by 2020. 7. Africans should benefit directly from their own natural resources. 8. African states need to keep showing strong solidarity with the people of Western Sahara and the Saharawi people, in one of the last colonies in Africa. In particular, African states should boycott any activities that are geared towards destabilizing the region. Likewise, it urges International Organizations and all other organizers to accomplish the decolonization process through political, economic, and sports sanctions against Morocco, Spain and France, as well as to cancel any meeting or activity planned in the occupied city of Dakhla. 9. African States should consolidate resources towards strengthening employment structures by creating jobs and opportunities for the youth to assure decent work, empower them and avoid concerning issues as the recruitment of young people into terrorist groups. 10. There should be the establishment of an African security policy with respect to resource mobilization management and the development of appropriate security personnel. 11. Pan Africanism respects diverse political ideologies and approaches for development of their members, celebrating the diversity in unity. 1. To actively promote the grass root development of the Pan African Movement (PAM) through clubs, educational institutions, youth led and youth focused organizations. 2. To collaborate with the Secretariat to fast track the formulation of the Pan Africa Youth Movement as resolved in the 7th Pan African Congress. 3. To organize a youth exchange program for the youth within the Pan African Movement, in all countries both on and off the continent. 4. To propagate the Pan African Agenda by harnessing the gains made by Information Communication Technology within the continent and Diaspora with an aim of mobilizing for the movement. 5. To establish Pan African Youth Solidarity Platform across the globe for the Independence of Western Sahara. 1. Put in place a Monitoring and Evaluation Mechanism that ensures the implementation of the resolutions of the PAC by strengthening the local, regional and secretariat capacities to implement resolutions. 2. Actively advocate for the transformation of the education systems to raise the Pan African Consciousness. 3. Ensure that the PAC Constitution is implemented to the letter. 4. Enhance linkages between Pan African investors and Pan African entrepreneurs to promote a thriving PAM. 5. Deliberately co-opt youth into all structures of the Pan African Movement including but not limited to the Governing Council and the International Preparatory Committee, and resuscitating the youth desk and congress. 6. Establish and elect a Pan African Youth Coordinator and designate such coordinator as part of the permanent structures of the Pan African Movement. 7. Ensure that the Pan African Youth Parliament is established via a deliberate electoral process. 8. Create a Centre for Pan-African Leadership and Excellence by which a new generation of Pan Africanists will be groomed in leadership, service and integrity. 1. Work towards assisting Africa to find its voice in the global space. 2. Provide African content in the curricular of institutions of media and mass communications. 3. Set up a Communications Unit in the PAM Secretariat as well as a Communications committee in preparation for the second Phase of the 8th PAC. 4. Establish and implement a strategy to popularize the values of pan-Africanism as well as activities of the global Movement. 5. Establish a code of principles for pan-African journalists as well as a network of politically-conscious Pan-African journalists and content producers (including bloggers, writers and social media activists). 6. Create, populate and popularize a Pan-African Calendar to highlight events and ideas of the Pan African movement. 7. Promote 25 May using all media to focus on Pan-Africanism. 8. Establish a pan-African publication on Pan-Africanism. 9. Establish a network for broadcasting pan-African news and ideas and create synergies with existing platforms. 10. Promote the use of African languages in African media. 11. Support existing pan-African publishing ventures to promote works that further the ideals of pan-Africanism. 12. Ensure pan-African publications that are available, accessible and affordable. 13. Establish Pan-Africa Media Awards. 14. Promote access to HTML code for all ages through regional trainings to ensure competencies to create PAM websites. 1. Promote arts education in schools and encouragement of education departments to ensure school curriculum that is afro-centric, recognizes the validity of Indigenous Knowledge Systems and promotes the values and principles of Pan-Africanism. 2. Facilitate cultural exchanges and ensure freedom of movement that by addressing the prohibitive nature of visas to facilitate this. 3. Translate knowledge from local languages into colonial languages and vice-versa so that information can be better shared. Institutes of higher learning with language departments and with funding from governments could be tasked with doing this at masters or doctoral level as a conditionality to receiving funding. 4. Establish and support existing pan African literary prizes/residencies funded by monies from the Pan African world. 5. Support the African arts industry by encouraging all African institutions and pan-African focused and led institutions and institutions working on the continent to commission and display visual art, play African music, African books, utilize African furniture and serve African food (airlines). 6. Strengthen existing institutions for example Pan Africa Writers Association (PAWA) and Academy of African Languages (ACALAN) to ensure that their efforts are being duplicated. 7. Make use of emerging technologies and ICTs, new media platforms including social media to ensure a wider reach to all constituencies. 8. Strengthen copyright law and promotion of purchase rather than piracy of works of art so that artists can make a living from their work. 9. Strengthen national associations of visual, performance and literary artists. 10. Establish a quota system in libraries and resource centers for African books, radio and TV for African music and films from the pan-African world. Eliminate VAT on books, film and music. 11. Ensure resolutions of the pan-African congress are fed through arts and culture education at regional culture and arts centers and the African Union. 1. Condemn worldwide the violence and racial discrimination perpetrated against black people wherever they find themselves. In that regard, the Congress should strongly express solidarity to the ‘Black Lives Matter’ campaign in the North America but more importantly consider the proposal that ‘African Lives Matter’ be adopted as a global campaign as a way of consolidating our common identity. Moreover, it is time that African leaders use global political platforms to condemn brutalities committed against African descendants globally and to speak of the holocaust committed against the African people, including the targeting of African populations who are incarcerated in disproportionate numbers in Western prisons. 2. Raise the contradiction of African leaders not responding to injustices meted against African citizens. For instance, there was a recent solidarity march in France joined by some African leaders to condemn the violence against French citizens in France whiles no African leader has responded to the atrocities committed against over 2000 people in Nigeria. 3. Encourage Africans to approach their issues from the bottom-up, as way of knowing themselves rather than being committed to top-down approaches. For instance, the manner in which African leaders recently succumbed to the US Africa summit sponsored by the Obama Administration. 4. Acknowledge that the debt burdens carried by most African countries is unconscionable and should be reviewed as part of the reparations discussion. 5. Acknowledge that the struggle of African people against Racism should also be looked at from a biological warfare perspective. For instance, the recent epidemic of Ebola in the West Africa region, in terms of its introduction, professional approach to contain and reduce infections and follow-up for both infected and non-infected populations should be seen as a critical issue of Western Imperialist aggression to reduce black populations and control their resources. 6. Address the origins of racism, particularly from the point of economic oppression and its manifestation as a state of mind, with appropriate mechanisms for all Africans irrespective of social status. 7. Call on the Congress to appeal to African leaders to show respect and love to themselves as a reflection of the people that they govern. The Congress should therefore appeal to all Africans to value themselves. 8. Appeal to African governments to train their diplomats in their foreign missions to make connections with the African people living in foreign countries to promote Pan African objectives. 9. Fully support the CARICOM initiative on Reparations as a model for addressing a particular form of reparations. 10. Recommend that PAM be more inclusive of all the Reparation initiatives in the Diaspora and in Africa as a united effort. This is to include all efforts, whether or not for formerly enslaved Caribbean people, such as N’COBRA in North America and the United Kingdom initiative. 11. Acknowledge our fallen or ascended ancestors who were not mentioned during the plenary session, such as: Bob Marley, Amb. Dudley Thompson, Harriet Tubman, Sojourner Truth, Queen Nzinga, Kwame Ture’, Cong. Donald Payne, Sylvester Williams, Marcus Garvey, Rev. Leon Sullivan, Rosa Parks, Dorothy Height, Ben Ami Israel, Julius Nyerere, Nelson Mandela, Oliver Tambo, Walter Sisulu, Walter Rodney, Tajudeen Abdul Raheem, Imamu Baraka, Elombe Brath, Maya Angelou and Malcolm X. 12. Draw the attention of the Congress to the absence of our Traditional Leaders in the Congress as custodians of the land and the symbolic embodiment of tradition and culture. This includes our religious leaders who have so much influence over the minds and souls of our people and the need to coop them into the Pan African movement/initiative. 13. Recommend that the identification of appropriate organizations to be a conduit for Africans of the Diaspora to partner the PAM initiatives at all levels and facilitate the involvement or inclusion of Africans from the Diaspora who have repatriated back home to Mother Africa. 14. Strongly support the actualization of the concept of the 6th Regional of Africa, being the Diaspora, by the 8th Pan African Congress. 15. Propose that the institutions that have emerged in the past 2 decades such as the PANAFEST, Emancipation Day, Mwalimu Nyerere Intellectual Festivals and others which have promoted Pan Africanism and contributed significantly to the Pan African movement be supported through incorporation at all levels of the Congress. 16. Strenuously call on all African governments to recognize the role of previous African societies in the human enslavement process and commit to dual citizenship for those Africans descendants who are unable to identify their countries of origin. After the resolutions from the Commissions were presented to plenary the session chair requested full additions and or amendments to the existing resolutions. Comments that could be were integrated into the existing resolutions proposed by the Commissions. Listed below are the outstanding resolutions that were not applicable to the existing Commissions. 1. Draft for the Pan African Congress a constitution that facilitates dialogue, resolution and action within the local communities and centers power at the African grass root. 2. Institute a committee to develop a general meeting of delegates from all recognized regions for approval and adoption of the constitution. 3. Provide an historical account of the development and activities of the Pan African Congresses since 1994. 4. Provide a concept on the way forward that will be accessible to all delegates at least two weeks prior to the next global plenary session. 5. Compile a database within 5 months of all opposition political parties across Africa and leftists organizations to ensure inclusivity in terms of representation at all levels of PAM. 1. That the Local Organizing Committee should publish a report of the first session of the 8th Pan African Congress within 3 months of the closing plenary. 2. That the above report should include a financial statement which includes identification of the friendly countries which supported the Congress through financial donations and the amounts. 3. Draft for the Pan African Congress a constitution that facilitates dialogue, resolution and action within the local communities and centers power at the African grass root. 4. Institute a committee to develop a general meeting of delegates from all recognized regions for approval and adoption of the constitution. 2. The membership be informed of the Governing Council’s decision in an equally timely manner so as to ensure the presence of all identified delegates by sectors. The Pan-African Congress wishes to pass a special motion of thanks to the initiators of this meeting, namely His Excellency John Dramani Mahama, President of the Republic of Ghana, and His Excellency Yoweri Museveni, President of Uganda and Patron of the 8th Pan-African Congress; Rtd. Major General Kahinda Otafiire, Convener and Chairman of the International Preparatory Committee (IPC); Members of the IPC; the Local Organizing Committee (LOC), Various National Preparatory Committees; the Staff and Volunteers of the Secretariat, and all those who morally and materially contributed to the success of this Congress. Finally, the delegates, participants and observers of this Congress hereby express their sincere gratitude to the people and the government of Ghana for their generous hospitality.